Aldila, True Temper, UST Mamiya, KBS, Fujikura, Matrix, Mitsubishi, etc, etc. One wonders how the world can sustain so many manufacturers of top-quality golf shafts. Only with genuine innovation can you hope to survive. Thankfully, Bellingham’s Aerotech Golf LLC is not lacking in the innovation department. Matt Kuchar was having a pretty solid 2008. In 18 starts before the end of June, the then 30-year-old Georgia Tech graduate had recorded four top ten finishes, missed only four cuts, and banked the very thick end of a million dollars. Then something went horribly, nightmarishly, seemingly irrevocably wrong. Between the AT&T National at the start of July and the Valero Texas Open in the middle of October, the 1997 US Amateur champion who won the Honda Classic five years later and an event on the Nationwide Tour four years after that, failed to earn a single penny - seven tournaments, seven straight Friday night finishes. He wasn’t struggling to break 80, nor was he missing those cuts by conspicuously wide margins (in fact, in the 14 competitive rounds he played during his lean spell, he averaged exactly 72 strokes a round), but he was 21-over-par for the seven events and when you don’t squeeze into the weekend at even one of them, you know something is up. As luck would have it, Matt’s father Peter had accompanied his son and was fitted for a new set of shafts himself. The Cool Clubs experts recommended Aerotech’s SteelFiber and during a round later that week, Peter suggested his son give them a try. ‘I was amazed at how easy they were to hit,’ says Kuchar. ‘It felt like much less work was required to hit them.’ Kuchar was soon on the phone to Aerotech’s President and CEO Chris Hilleary saying he had tried his father's SteelFibers, liked them and wanted to switch. Hilleary sent him seven 95g shafts (4-iron-PW) and Kuchar put them in play the very next week at the Justin Timberlake Shriners Hospitals for Children Open at TPC Summerlin in Las Vegas. The results were extraordinary. Kuchar opened with consecutive rounds of 63 and followed up with 71, 67 over the weekend to complete 72 holes in 264, -24, and a shot behind winner Marc Turnesa. 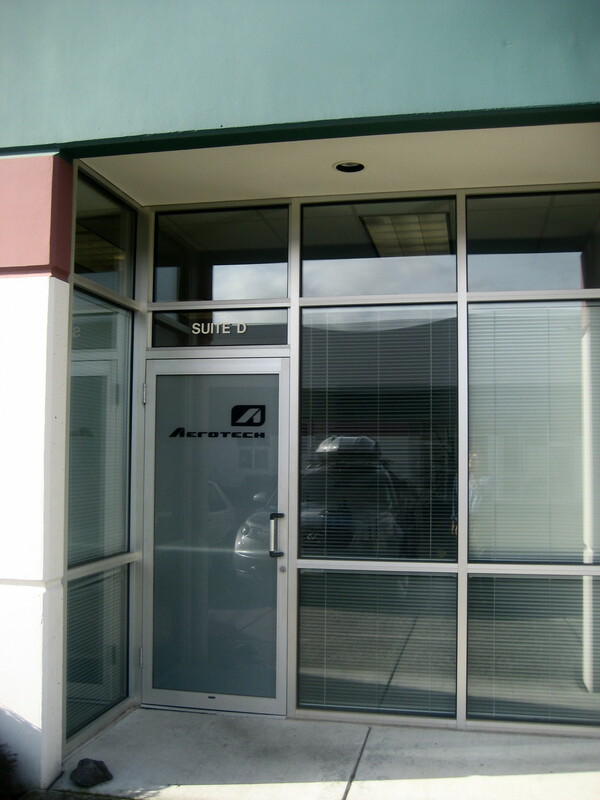 Aerotech Golf LLC is based in a smallish warehouse building on Midway Lane, a block from Bakerview Rd, and began life as Aerotech Sports in 1991. The company originally specialized in hockey sticks, becoming the first manufacturer to introduce a composite stick approved by the NHL and, at one point, becoming the second largest maker of hockey sticks in the world. It branched out, expanding its product base to include bike components, helmets, fishing rods, knee braces, violin bows and, three years after it incorporated, golf shafts. Hilleary, who graduated from Western with a degree in manufacturing and engineering then worked in the ski industry and as a commercial fisherman in Alaska before returning to Whatcom County, remembers a very fruitful period for Aerotech Sports. ‘We were making between 40,000 and 80,000 shafts a month for the Adams Tight Lies,’ he says. 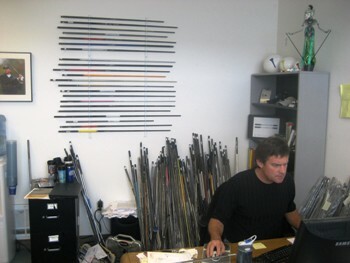 ‘And we were also producing shafts for other OEMs like PureSpin, Lynx, Zevo, Cleveland and Snake Eyes.’ In 2002, Aerotech Sports felt the time was right to launch its own brand of shafts, offering the all-graphite Powercoil initially and later the SteelFiber which was initially available only through Golfsmith and which helped Aerotech establish a reputation for innovation and cutting-edge technology. More than 59 miles of the steel fiber, manufactured by a Belgian company, is wound onto the graphite in a hoop orientation, producing a shaft that is lighter than steel but altogether more consistent and predictable than a typical graphite model. Another big name player to discover the benefits of the SteelFiber was Retief Goosen whom Hilleary had met on the practice range at the Players Championship in 2004. ‘I knew the TaylorMade tour rep pretty well,' says Hilleary. 'She introduced me to Retief and I explained the concept and how we built them. He went straight into the TaylorMade tour van and told the guys in there to build him whatever I said he needed. Within 20 minutes, he was hitting the SteelFiber on the range.' At the time, Goosen was 17th in total driving (average of distance and accuracy rankings) on Tour, but within a month he was number one. In October 2005, Hilleary bought the golf division from Aerotech Sports and renamed it Aerotech Golf LLC. Today the SteelFiber still accounts for over 80% of Aerotech sales and is available as a custom shaft in Nike, Cleveland, Scratch Golf, Srixon, and Miura clubs as well as a number of other OEM models. Last year, at least 13 competitors had the Claymore in their bags at the Re-Max World Long Drive Championship. It is undoubtedly a very good product and will no doubt attract a considerable number of devotees. But at the end of the day, it’s an all-graphite shaft, and thus probably not as likely to create as much buzz as the SteelFiber which will continue gaining plaudits and, in turn, market share as more and more players are made aware of its virtues. And in February, Hilleary took a call from Jeff Quinney who had been messing around with Kuchar's clubs on the range at Riviera Country Club ahead of the Northern Telecom Open. ‘He wanted me to send him some samples as soon as possible,' says Hilleary. 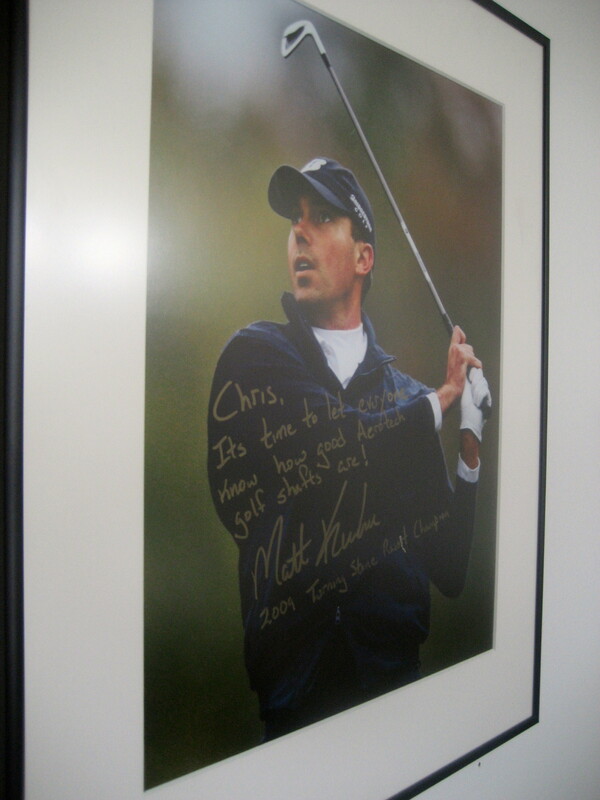 On a wall in Hilleary’s humble office on Midway Lane, hangs a signed photograph of the SteelFiber’s most enthusiatic advocate with the inscription: ‘Chris, it’s time to let everyone know how good Aerotech shafts are – Matt Kuchar, 2009 Turning Stone Resort Champion’. 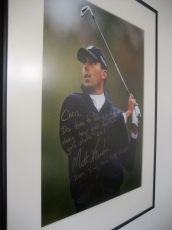 Aerotech is not in a position yet to compensate professionals for endorsing its products, so Kuchar isn’t contracted to put what he wrote on the photo on the record. So allow me to do it for him. For more information, including Aerotech’s current product list, log on to: http://www.aerotechgolfshafts.com/.